Welcome to Travel Tuesday! We sure hope you are ready, wands and hats all packed for a great adventure. We're going to be taking you on a written adventure to some of the greatest Harry Potter Attractions around the world! This week we are starting off the first in our series about Great Britain- the home of the magical place we love. Fun fact: J.K. Rowling came up with the idea for Harry Potter while on the train, dreaming of a school for witches and wizards which was centred all around one little boy and his adventured. We've come to know him Harry Potter. 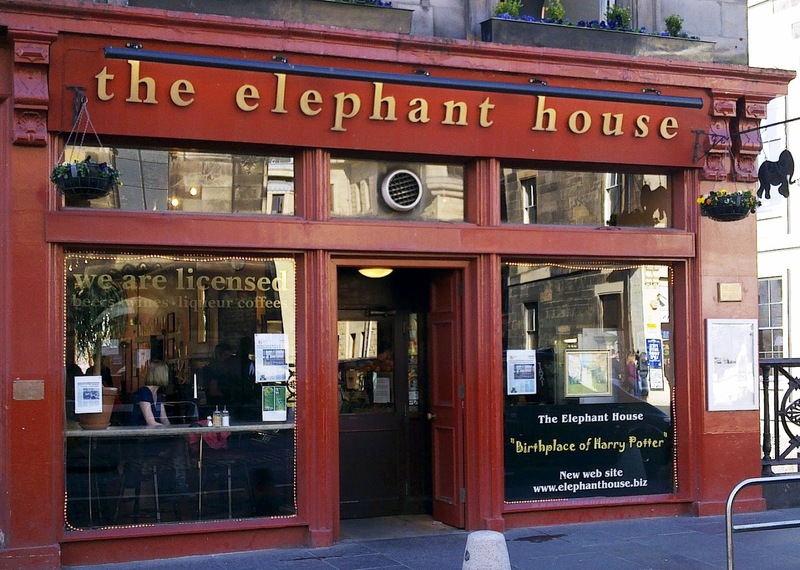 We first start this Great British Harry Potter series at the true birth places and real life areas in which the idea for Harry Potter was first written down- The Elephant Cafe, Scottland. A place which proudly calls itself "The Birthplace of Harry Potter". This cute little Café was an area where J.K. Rowling chose to write many of the scenes of Harry Potter, sitting at a table and letting her imagination go wild! Perhaps it would bring out the creativity of anyone who was to visit it? There must be some magic involved with this little Elephant House. You never know if you don't try *winks*. How cute is the café itself. I am certain you'll find me sitting there one day, writing my own little adventures. However, that's as soon as I get the hand of not Apparating and leaving an eyebrow or two behind. From Scottland to Surrey- The next attraction has to be the first place we ever set eyes on in Harry Potter. On a little quite street, with a strange animagus and a magic dilluminator- Little Whinging. The place where you first meet the protagonist of this world's much loved books. And the place you come to hate after years of watching a boy live under the stairs or have bars on a window. This was the place of your dreams as a child, the home you wished you could go to and recieve your letter. Of course, not while living with the Durseleys... They were the part I'd miss out on that part of the story with pleasure. I especially would have loved to own a house with so many owls around it- what an incredible shot! Before leaving England again to return to Scottland for the last attraction of thi blog, I would like to take you to a place which held your deepest nightmares as a kid (or at least, my nightmares). This bridge was the source of a death eater attack which caused it to rip apart while muggles were still on it. However, you won't find it ripped like it was back in the tragic event. It has been restored to it's greater glory and now can be found as a scary reminder of the things Death Eaters did to the muggle world. You'll no longer find evil dementors hanging around in groups anymore trying to destroy things. And now- Back to Scottland! What an adventure I've decided to take you this week. This is the last stop for this blog, but certainly not the end of our Great British Harry Potter adventure! To get to Scottland for this adventure, we will be taking a train. This train's journey starts at the mysterious Platform nine and three quarters. The the train which is shown in the movies can be found in Scottland. Yes, that's right, it's a real journey you can take! The Jacobite Steam Train (AKA- Hogwarts Express) is the train souly used for the filming of the harry potter movies and many of the scenes can be found on it's train ride. Nowadays, it is missing the well know "Hogwarts Express" name plate, but is still the train in all it's glory. You can take this train yourself, and it's quite spectacular. As a young girl; I took this journey myself and was, once again, in love with Harry Potter. Of course, it doesn't actually take you to Hogwarts- too many muggles on board-it would be a catastophe for the ministry! But it will take you on its own, special adventure. Not to mention, it is really comfortable! If it wasn't for the stunning Scottish highlands, I'm pretty sure I would've fallen asleep in the classic (and comfortable) steam trains compartments. That's all for this week, my dears! We will be return next week with more travel areas for you to feast of your eyes. On behalf of the entire SoMe team, I would like to wish you a very happy pancake day if you are in the tradition of celebrating such an event. We would also like to wish you, as always, magical blessings and love.